Electa LMS provides an option to give discounts through coupons to your students when purchasing paid events and live sessions as well as paid online courses. You can create one or multiple coupons and distribute these codes to your students. Later at time of purchasing students can get discounts by filling in a coupon code. To access this tool you must be logged on as an account administrator. Then click on Management > Discounts & Coupons from the main menu. To create a new discount coupon click the Create button and fill in the new coupon details. The coupon code can either be specified or auto generated. The description filed is to provide some descriptive information for your coupon. This is not visible to students. Optionally you can specify a best-before date as well as a maximum number of times a coupon can be used. To create a time limited coupon just fill in a date and this coupon will not be valid past that date. 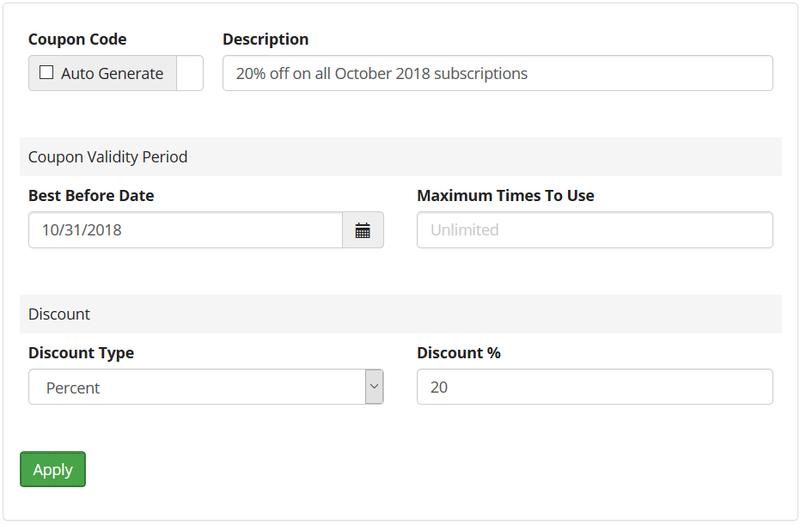 To limit the number of times a coupon can be used in total, fill in a number in the Maximum Times to Use field. Leaving it empty will not put any limits on the usage counter. Finally you have two discount options to choose from - percentage or a fixed amount. For coupons with a percentage discount the price will be reduced by that percentage. For instance a $100 price will be reduced to $90 if a 10% discount coupon is applied. Respectively, a fixed amount coupon will reduce the price by that amount. For example, a $50 price will be reduced to $45 is $5 discount coupon is applied. Important: fixed amount discount coupons applied to prices with a lower value will remove the necessity to purchase a subscription. For example - if a $50 coupon is applied to a price of $40 the resulting value will be brought down to $0 and the student will get the subscription free of charge. To save the new discount coupon click Apply. You can modify existing coupons using the red options button next to each coupon in the list. A coupon which has reached its best before date or its usage counter has reached the maximum usage counter value will be automatically deactivated and placed in the Inactive list. To permanently remove a coupon from the list use the red options button and click Delete.